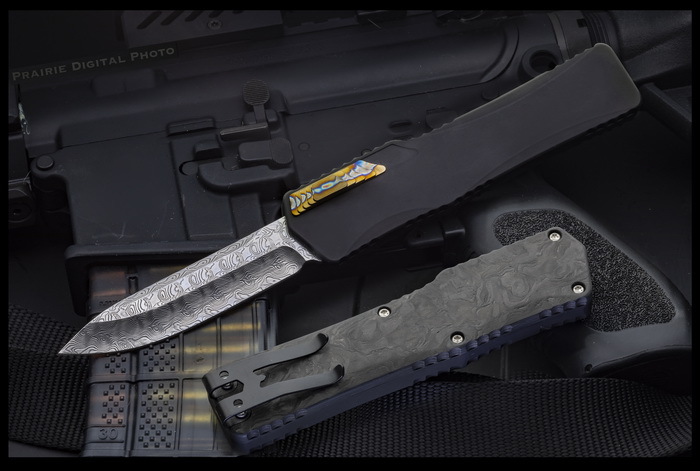 Tony Marfione has crafted a custom version of his Cleric OTF Double Action Automatic with a 3.5-inch clip point blade of Vegas Forge Damascus heavily etched and polished. The handle is Marbled Carbon Fiber and Hard Anodized Aluminum with a Flame Colored Titanium firing button and black hardware. The pocket clip is Tony's signature 17-4PH Double Prong Heretic clip. It offers a heavy duty build with a clean fit and finish, and a fierce double action automatic opener. The handle has a front loaded thumb slide for ease of use and subtle contouring for a substantial grip. In 2015 my wife, Jessica, and Anthony Marfione, Jr. founded Heretic Knives. As a second generation knife maker, applying the knowledge that has been passed to me, I want to bring designs and certain elements to the craft that haven’t been tried before. In closing, I look forward to passing the same knowledge, plus what I’ve picked up on my own, down to the next generation. We pledge that every knife that leaves our facility is an impeccable work of art that is sure to impress! Each of our custom knives comes with a laser marked, stainless steel certificate of authenticity. On it you will see the model and blade finish, as well as the handle material, date of birth, and serial number. Every certificate is signed by TJ Marfione.